Greg Massarone, RN, is the Nurse Manager of our Hyde Park location. In addition, he has taken on the role of corporate clinical trainer. 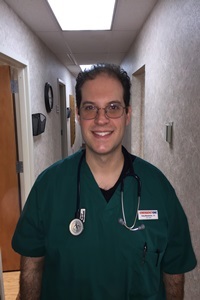 Greg joined Emergency One in 2010 as an LPN. He received his degree from Dutchess County BOCES in 1997 began his career working in home care and private practice. His love for nursing led him to further his education and continue on for his Registered Nurse degree from Excelsior College in November of 2015. Greg oversees the daily operations of the Hyde Park office. He is responsible for the supervision of staff, and providing a high level of patient care. In addition, Greg is certified as a breath alcohol and drug screen technician, qualifying him for DOT and non-DOT testing. He conducts pulmonary function testing, audiograms and FIT testing for our occupational health services. Often times, Greg can be found onsite with our occupational health team, working with colleges, fire departments and other clients. A longtime resident of the Hudson Valley, he enjoys restoring classic and antique cars.